I See Me! - Create a keepsake book for a special child with one of their "My Very Own" Storybooks. 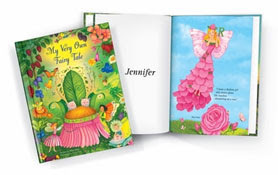 The company offers My Very Own Name Personalized Storybook, My Very Own Fairy Tale Personalized Storybook, and My Very Own ABC's Personalized Board Book along with several other personalized items including personalized canvas wall art. We received a sample copy of A Christmas Bear for Me, a version so popular it is already sold out and is no longer available! The hardcover book we received is printed in full color on quality glossy paper and came encased in a special keepsake box. Frecklebox - This past spring I won a Frecklebox contest and received a special nature "My Name Is" Hardcover Personalized Book from Frecklebox for my daughter. We liked it so much we ordered another for my son and one for my nephew as well. The child's name is magically spelled out by natural items like the stars, flowers, and birds. The repetition in the book helped my daughter memorize the letters of her name. You can flip through the pages of a sample book on the website to get a closer look. Frecklebox offers several different book choices as well as a large number of other personalized items such as puzzles, placemats, posters and coloring books. 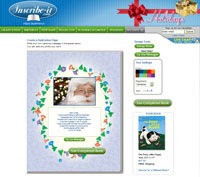 Inscribe-it - Inscribe-it sells popular children's books titles including Little Golden Books, classics, holiday books and more, all available for personalization. Their technology allows customers to include a personal dedication and full-color photograph in the beginning of the book, making it a treasured and personalized keepsake. Do your kids have a personalized book or do you know of any other companies that offer personalized books for children? I'd love to hear about them. If you do plan on ordering a personalized book for a holiday gift, make sure to place your order soon to meet the holiday shipping deadlines! Wouldn't it be fun to receive a personalized book from Santa? My kids would love it. Happy reading and Happy Holidays! Wow! I really love the look of the 'My Name Is...' book. What a fabulous idea. The nature aspect of this book makes it a bit different to the regular run of the mill personalised books. I'm a bit late for Christmas gifts, but for the children in my life this book will make perfect birthday gifts thoughout the year. What a great idea! When my daughter was born, my aunt looked for a book with her name in the title. I later learned that is her go-to new baby gift. I have started doing the same thing, but now that I know about inscribe it, I can add something special to it! this is so amazing. great idea. I will be back later to get the links. We have 2 books from Freckle box, both softcover, and they are really worth the price. We have My Name Is...which is gorgeous, and the one about a visit to the zoo, which is good for older preschool b/c they can search for their name hidden in each picture.